There's no doubt the Pixel 2 and the Pixel 2 XL are two of the most highly anticipated flagship phone launches yet to happen this year, and thanks to an anonymous source "familiar" with Google's plans we now have more details to go on. As XDA Developers reports, the source says there will indeed be two new Pixel phones this year: one sporting a 4.97-inch screen that's largely similar in size and look to the original phone, and a bigger device with a 5.99-inch display that goes a little way beyond the size of last year's Pixel XL. It's that larger device, codenamed Taimen, that sounds the most interesting. Apparently the bezels will be shrunk, a 128GB model will be on offer, and LG will be the manufacturer behind the 1440p display for the phone, all of which sounds interesting, provided you can get your hands around it. Both phones will feature single-lens cameras according to the source, even though the trend for dual cameras is picking up steam, and both devices are going to be fitted with a Snapdragon 835 CPU and 4GB of RAM. Those specs match the leaks we've heard so far. 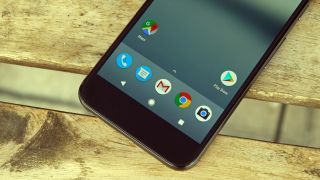 It does seem as though Google has abandoned plans to bring out three different Pixel phones this year with three different screen sizes - if XDA Developers' sources are correct then the middle model has been cut, leaving the standard and super plus sizes. Apparently the 3.5mm headphone jack is due to get cut as well. The leak also suggests the glass window panel on the back of the larger Pixel 2 phone is going to be smaller and will no longer cover the fingerprint scanner, while the design for the smaller model remains largely unchanged. In a few months we should know exactly what Google has been building.